Since opening our doors in 2007, our goal has been to provide your patients with long-lasting outcomes, minimizing the need for surgery, medication, or diagnostic imaging. To accomplish this goal, we focus on three things – clinical excellence, service expectations, and empathy and compassion. Called to Care ensures that BreakThrough staff fosters an atmosphere of compassion, empathy, and service. The program uses a validated CARE Measure to track patient feedback and compare results to a database of other healthcare providers. BreakThrough consistently scores in the 95th percentile when it comes to listening and communication as re. 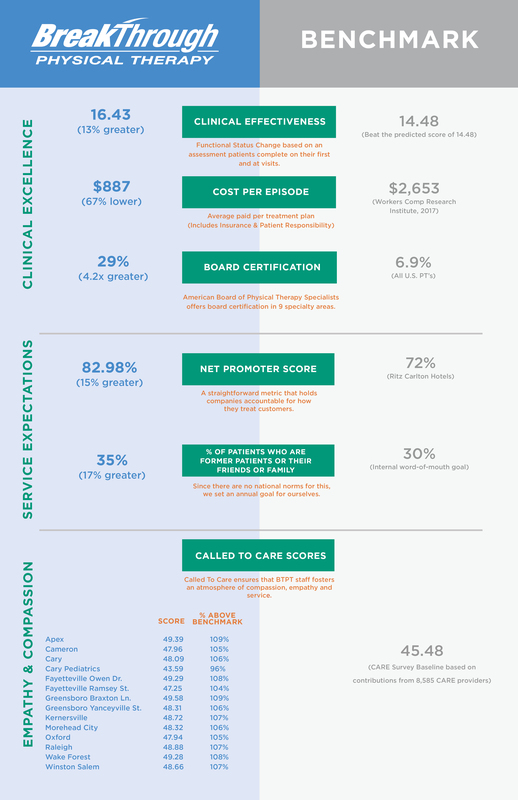 The Baseline score is based on contributions from 8,585 CARE providers from www.caremeasure.org.